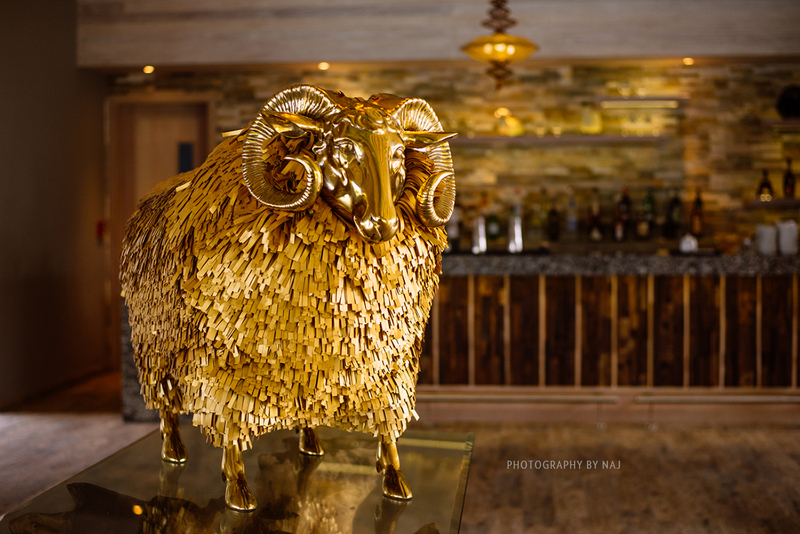 What does world-class hospitality, Aretha Franklin, a golden sheep (named Shaun), and a UNESCO biosphere reserve have in common? Nothing. That was, until Finolhu resort sprang into life two months ago. Now, you can experience a Maldivian vacation like no other, bringing a refreshingly retro, beach-holiday vibe to the heart of the Indian Ocean. This is a place that has to be seen to be believed (and even then it’s not guaranteed). The short flight to Dharavandhoo airport takes you over the pristine Hanifaru Bay, before a speedboat whisks you further into the surreal beauty of the atolls. Upon arrival at Finolhu, however, you disappear completely into a fantasy world entirely of your host’s creation. Luxurious nostalgia. Cutting-edge retro. The beach holiday you never knew you always wanted. Finolhu is the second offering from the Small Maldives Island Company, whose Amilla Fushi resort opened in 2014 – also in Baa Atoll. 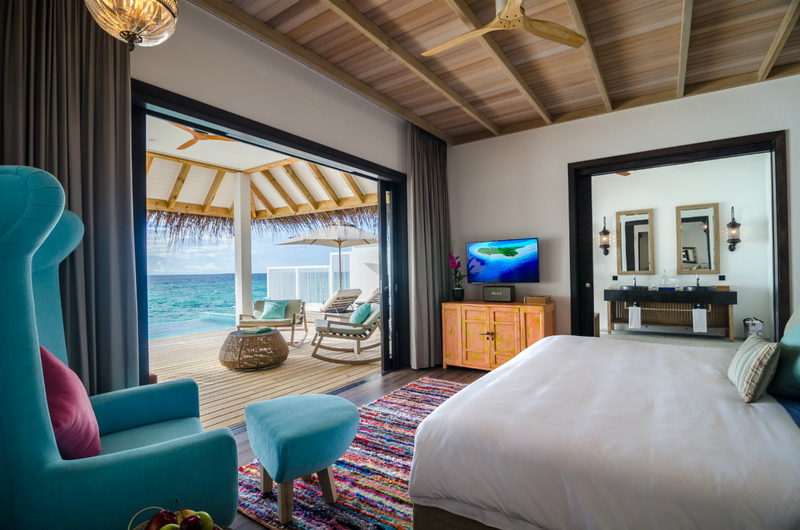 Priding itself on its carefully selected locations and attention to detail, the company has worked with Coastline Investments to create a fresh approach to hospitality in the Maldives. The unique design and concept of Finolhu was spearheaded by General Manager Mark Hehir, utlilising two decades’ of experience in the Maldives to craft a resort that simultaneously takes luxury travel into the future and back to the past. 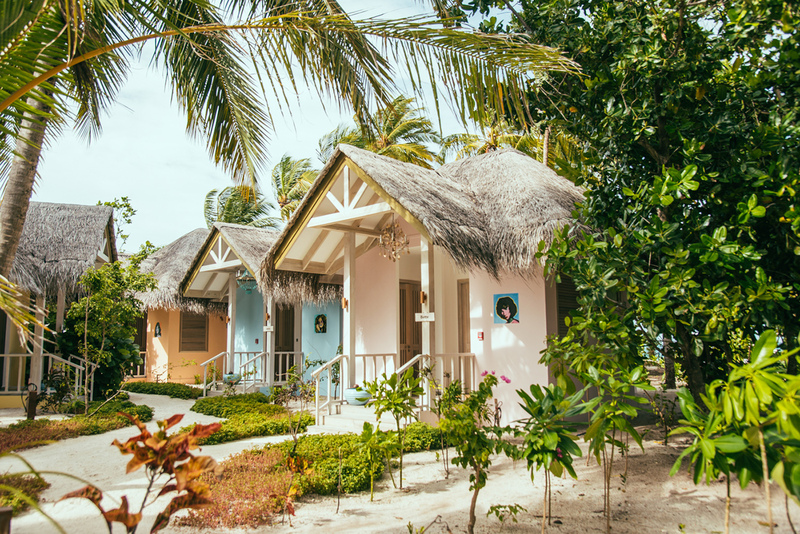 Amply supplied with the Maldives’ essentials – stunning water villas, incredible food, and a tropical ocean playground on your doorstep – Finolhu immerses guests in its ‘beach club haven’ theme with incredible attention to detail. ‘Mojo’ men are on call day and night to cater to your needs, while some villas feature 60s style phones, reincarnated here solely for the ordering of champagne; vintage for vintage. The mini-bar is stocked on your arrival; wines and chocolate, lollipops and sherbert. Lagoon Villas and Ocean Pool Villas, curving over the reef, are inspired by Bohemian and French Riviera styles. To get to the larger Moorish-inspired Beach Pool Villas, head down Route 66 and take a right on Penny Lane Walkway leading to Sunset Blvd (if you spot that golden fleece, you’ve gone too far). 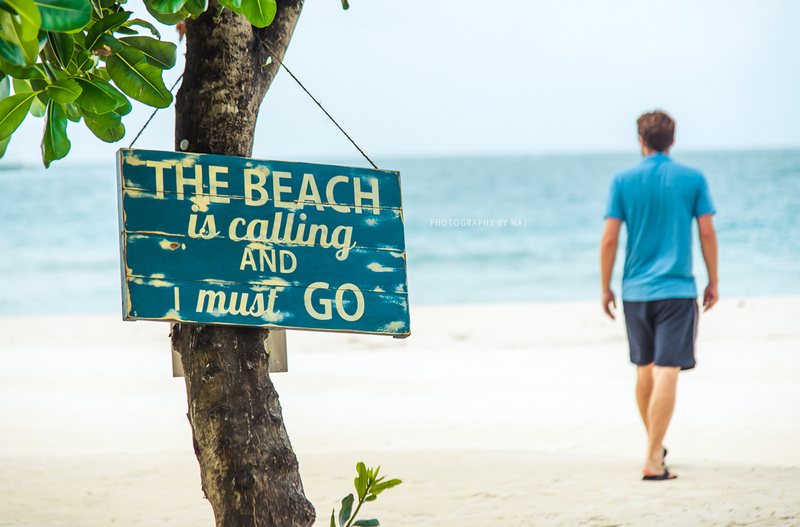 Wandering around the island, signs show the way to the gym, the ‘Baa Baa Beach Club’, and ‘Thunderball’ water sports centre, as well as reiterating the resort’s raison d’être; ‘If you’re not barefoot, you’re overdressed’, ‘I need some vitamin sea’, ‘the beach is calling and I must go’. After a few hours, the VW camper parked in the beach bar doesn’t seem so strange as you head out to the ‘Fish and Crab Shack’. Serving classic seafood, this rustic restaurant would not seem out of place in any seaside town were it not halfway down the sprawling 1.8km sandbank from which the resort takes its name (regular ferries are also available). Staying true to its pop culture motif, the resort takes its music seriously. 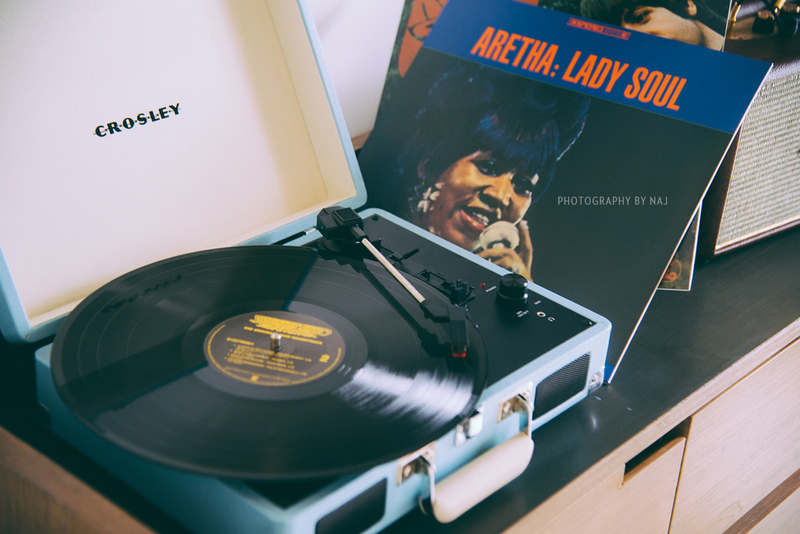 Marshall speakers (bluetooth enabled) grace every room, while larger suites come equipped with their own record players and a selection of classic vinyl. Indeed, it is through its music that Finolhu’s fantasia is typified. As the in-house DJ introduces you to Nina Simone, Andy Williams, and Gary Puckett by the pool, a conversation with the in-house mermaid is not uncommon. At the Cove Club – ‘spa’ is a word never uttered in the resort – mystical chants and whale music is replaced with the Ratpack and french yé-yé pop. Likewise, the treatment rooms are named after iconic performers. (You’ve never really heard Sinatra until you’ve heard him while having a full body massage beneath a picture of Barbara Streisand). 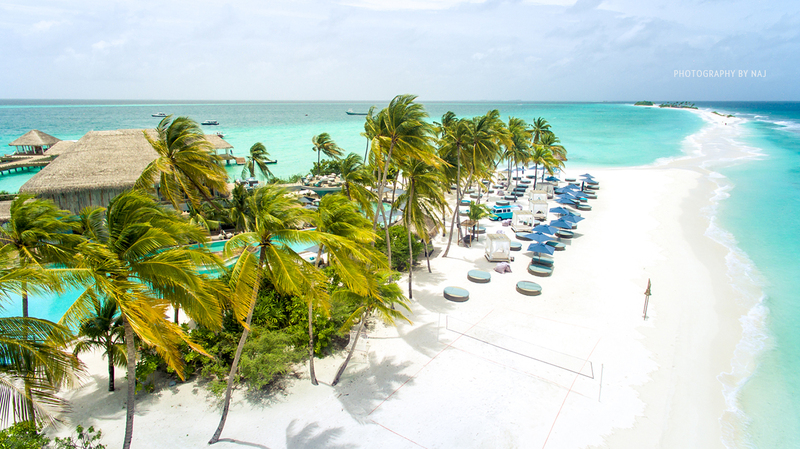 As the sun dips beyond the breathtaking blue horizon – after you’ve tried one of the resort’s three main dining venues – events at the beach club dive headlong back into fantasy. Live music is accompanied by stunning nightly performances from acrobats at the Beach Club Bar. Fire dancers and stilt-walkers dazzle by the pool, while a cinema and games room upstairs makes the two-story entertainment hub the best place to kick-start your dreams before you head to bed. You’ll be rubbing your eyes in disbelief as you say goodnight to Shaun. Indian Ocean nostalgia isn’t what is used to be.